Whilst tidal bores can be watched at other times of the year, they are not as big. And here is a tip should you want to see what this is all about. Get yourself a copy of the Sarawak Government Almanac and read the 'Kuching High Water' column, add another ten minutes to the listed time to determine when to be at the waterfront. Alternatively visit the Sri Aman Resident Office webpage to get the latest. Always allow yourself an extra ten to fifteen minutes to get into position. 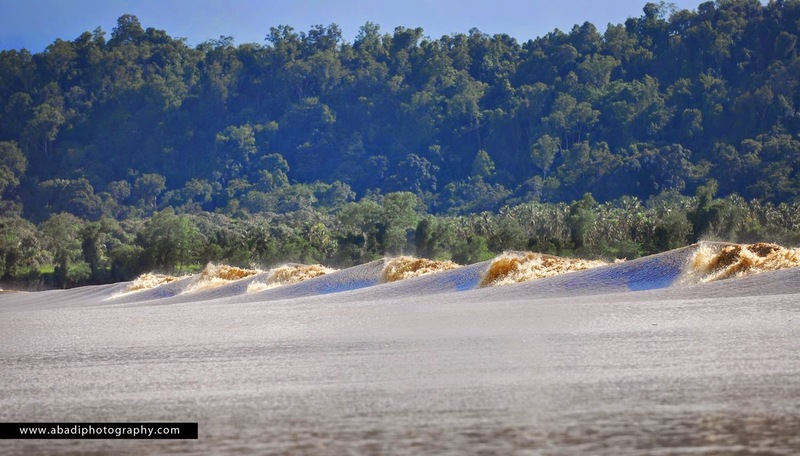 Sri Aman has a tidal bore observatory called 'Taman Panorama Benak' where it gives you a vantage point to watch the surging waves as they travel up the Batang Lupar river - the third longest river in Sarawak at 200 km in length. The tidal bore seen as a thin line across the surface of the river in the distance. Above and below: Taman Panaroma Benak. Beneath the platform is a 'Tidal Bore Gallery'. 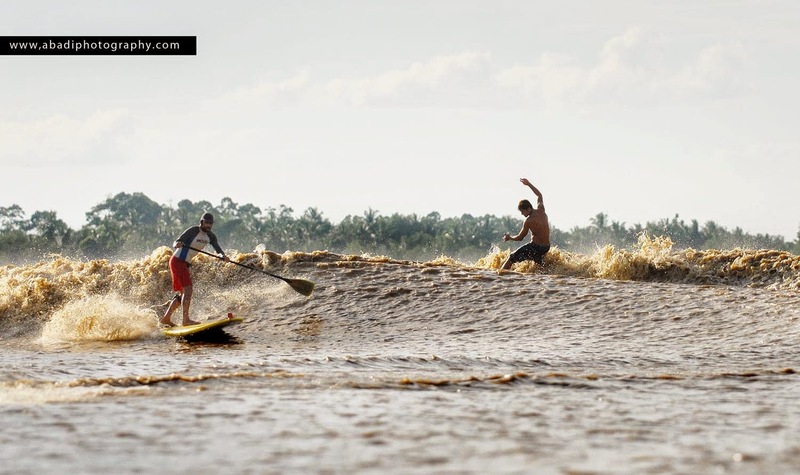 Sri Aman hosts the annual Tidal Bore festival known as 'Pesta Benak', normally held in the month of May. Besides the stand up paddle surfing (SUP) and board surfing spectacle, the festival has plenty of side-events such as speedboat and longboat race, exhibitions, stage shows and of course food! 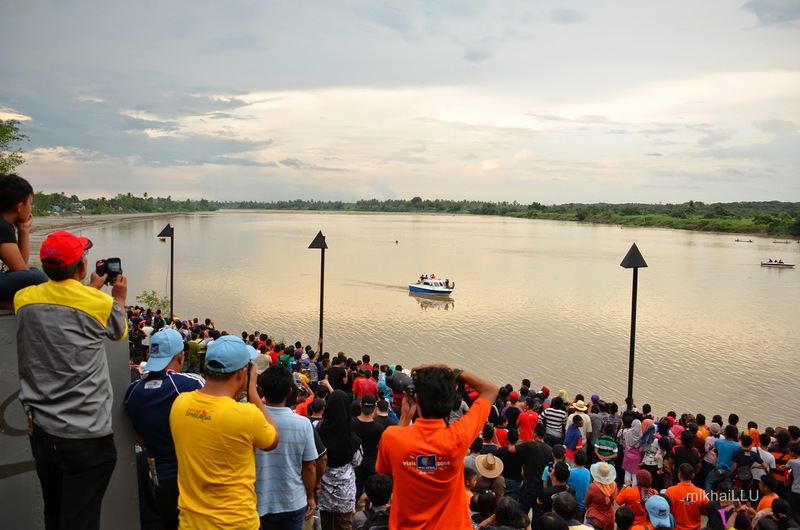 Pesta Benak attracts thousands each year and so it is advisable to book your room early. It is recommended to stay overnight as the tidal bore occurs early morning and late afternoon. At this point of publishing, the historical Fort Alice is undergoing restoration work. When completed, it will serve as a community heritage museum. The fort is located next to the Tidal Bore Observatory. The town of Sri Aman is a 3-hour drive from the Kuching, the capital city of Sarawak. To get there, you have to catch a bus from Kuching Sentral. Of course hiring a car will give you much flexible stops along the way, such as at LaChau bazaar. Malaysian Airlines, Air Asia and Malindo Air flies daily to Kuching from Kuala Lumpur. Air Asia and Silkair (also code share with Malaysian Airlines) flies daily from Singapore. Do check their website for latest.